Cocktails with Creatives brings fun, passionate people together to share their ideas, works, thoughts, and love of the arts with the Rochester community and beyond. Enjoy cocktails and conversations with Amanda Chestnut, Danielle Ponder, and Bradd Young. 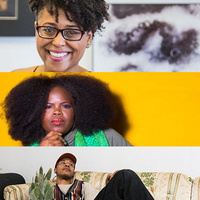 Hear each talk about their perspectives on art and the local creative community. Tickets include complimentary hors-d'oeuvres, a signature cocktail, and museum admission. $15 tickets/$17 day of.